Draft text of the homily, it may vary considerably from the recorded version. Please pardon any typos, and do not cite without permission. This morning I have the honor of speaking to our Rite 13 youth…Charlotte, Riley, Lucas and Nora. This is their day when we celebrate a rite of passage of sorts. It’s not Confirmation, that will come later, but an acknowledgement that becoming a teenager, becoming 13, is a time that you need support and encouragement and nourishment of the spiritual kind. It can be a scary time, filled with exciting possibilities for the future, but still tethered by the roots of being dependent on parents, teachers, community and church to help point you in the right direction and support your growth. Now even though these words are specifically for our four teens today, they’ve assured me it’s OK if you all listen in and think about your own spiritual growth too. When I saw the gospel text for the day I had to smile. I know that Becky Taylor really loved these verses and structured church school last year around the verse, “I am the vine and you are the branches. Those who abide in me and I in them bear much fruit, because apart from me you can do nothing.” When one thinks about nurturing and support of the children and youth of All Saints, Becky immediately springs to mind, as she was such a faithful source of nourishment and tending of their spirits. I also had to smile because this is also MY favorite image of God and God’s people. As a very young child, I read these words weekly, as they were carved into the wood surrounding the chancel at St Peter’s Roman Catholic Church in Dorchester. 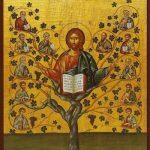 At 7 I didn’t know much about growing vines, but each week I tried and tried to understand what Jesus meant by “I am the vine and you are the branches”. It was in fact a kind of prayer or meditation that I engaged in for years and I can’t help but think it shaped me as a follower of Jesus. Finally I had to smile because I really can’t think of a better gospel lesson for our Rite 13 youth and this celebration today. 13 year olds in particular are in this magical place when they, where you, imagine they are invincible, can plan to be and to have anything they would want in the world and most of all, feel they can accomplish all this on their own. I say this to you all today, thirteen year olds, because I of course used to be 13, (can you imagine?) and I thought exactly the same thing about my future, my life and my own ability to navigate the world without the help of those annoying adults who kept telling me what I needed. Anybody else have this experience when they were 13? Look around you for a moment and see in what good company you find your selves! If there were ONE SINGULAR THING I would wish for you, one thing you would learn as you become older teens and young adults, it is that YOU SHOULD NOT TRY TO GROW UP ALONE. Our culture encourages individualism and following our own paths and making a mark based on our capacity to be entertaining (YouTube videos) or to get as many “likes” as possible on our Instagram pictures. None of these things is BAD in and of itself, but you just need MORE than this. We ALL need more than this, to flourish, to grown, to produce fruit in our lives. Mentioning “producing fruit” brings us back to the vine and the branches. 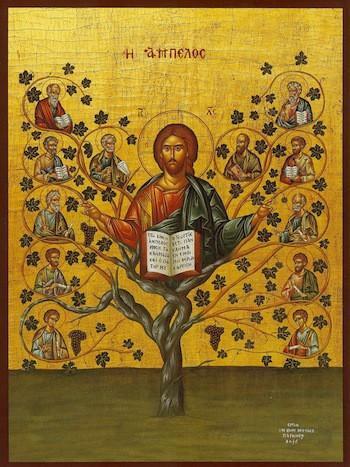 Thinking about that picture, Jesus being the vine, the large supportive structure of the grape plant, and we being the branches, the off shoots of that vine, is exactly right. We depend on Jesus, the vine for our spiritual nourishment, for our support, for our community surrounding us as we will surround you during your time of blessing here today. Thinking we can bear spiritual fruit without the vine is simply a mistake. Have you ever seen fruit that has begun to grow but then fell off the tree or plant and is lying on the ground? What does it look like? Its growth has stopped, it is not ripe (think about a green strawberry or tomato), it wouldn’t taste good if you picked it up off the ground and bit into it. Fruit needs the continued nourishment and water and sun that staying attached to the vine provides. Maybe this all sounds pretty obvious and what control does a strawberry have if it gets detached from a vine anyway? Well, this is the thing about Jesus. You and I know and I think those listening to him that day knew, Jesus isn’t really talking about grapes on a vine or strawberries on a plant. He says “Just as the branch cannot bear fruit by itself unless it abides in the vine, neither can you unless you abide in me.” AH HA! Once again Jesus catches them, Jesus catches US, by talking about something they understand in their own lives and then makes a CONNECTION to his own purpose of helping them get ready for his departure, start to tell the Good News of the Gospel in the early church and most importantly, remain nourished and cared for in the presence of the Holy Spirit, which will sustain them, feed them, help them to produce fruit in their lives. Do you get it? YOU are the fruit of the vine! Your parents or grandparents or your guardians have raised you and cared for you throughout your life, all thirteen years of it, to help you become the best fruit you can be! Ripe and full of life and nourishment for the world. And now it’s coming to a time in your life that you will start to decide if you want to remain, to abide, in that place where you can continue to be nourished and tended to or if you think you’re good and you can take it from here. I wonder what effect that decision will have on your fruit? I’d like to make sure you know I’m not saying your family, your church, your school has to do everything for you. That’s not nurturing, that’s suffocating! Here is however what all of those, family, school, sports, music groups, theatre and to me very critically CHURCH, can continue to do for and with you as you continue to grow and flourish into your life. First is CARING. We at All Saints LOVE YOU and your changing teenage self. We want you to participate in worship, have a sense that prayer is powerful and know you have people here to whom you can tell anything, ANYTHING, without fear of judgment or laughter. Next is CONNECTION. The people here will be here for you all through your teen years and as you enter adulthood. When you feel that you are absolutely and utterly alone in the world, and you will feel that way, call or text someone you know at All Saints. Stay in your church community. Remain and develop connections with each other, older teens to show you the way and adults who have been through it all before. Abide with Jesus. Go to him in prayer, ask for help, share your joys, grow and mature in your faith. Take that fruitful faith and share it with others. With family, with friends and perhaps most importantly with the folks you don’t know, the desperate, the hungry, the lonely. Show them Jesus in all our interaction with them and help them to see that He is the vine and that they may also abide in him. Become his disciples.